Kosmo, CH Derby’s Read Em And Weep MH, is a NEW AKC MASTER HUNTER, Trip wins 1ST PLACE in Open Derby, Remus qualifies for his 1st Master Hunter leg and wins 2 back-to-back 3rd placements in Open Gun Dog retrieving stakes (both stakes were majors, and!!!! Suede picks up 3 MASTER HUNTER QUALIFIES IN A ROW and her son Peak picks up 3 JUNIOR HUNTER QUALIFIES IN A ROW!!!!! Remus, CH Shakin’ My Booty Rezzamatazz CGC SH, is a NEW SENIOR HUNTER and Kosmo has PERFECT weekend with back-to-back Master Hunter qualifies!!! Kosmo Takes a Placement in the 4 Point Retrieving Amateur Gun Dog Stake in the Rocky Mountain Vizsla Club’s Inaugural Walking Field Trial!!! At the Junior level, so long as you don’t let your baby bird dog catch too many birds (so she stops pointing) or make her gun shy (by incorrectly socializing her to the gunshot), an AKC Junior Hunter title should be fairly easy to come by for most well-bred gun dogs. And, it should be fairly easy as this level is designed to be an introduction to AKC hunting test games for both inexperienced bird dogs and handlers alike. The Junior level is intended to test a dog’s natural ability and should require very little training (mostly around the gunshot, introduction to horses, basic obedience such as a recall–handy for when your juvenile bird dog is in full chase after a bird in flight). My caveat here is what a person’s future goals are in regard to more advanced tests/trials such as Senior, Master and Gun Dog Stakes (field trials). If the intent is to only ever put a Junior Hunter title (JH) on a dog then training or prep work isn’t all that important (again, so long as the pup doesn’t catch too many birds or is made gun shy). If, however, a person plans to go on to the Senior and Master levels or compete in Gun Dog stakes, how a young and/or inexperienced gun dog is exposed to birds becomes very important. This early training becomes critical in the foundation that is put in place. As is the dog’s overall obedience/yard work (whoa, here, heel) and retrieve training (playing retrieve games, never scolding your pup for carrying items–regardless of it’s appropriateness, etc). Over the years, we’ve seen a lot of people come out, run their dogs in Junior level hunting tests (and have a blast doing so), pick up a Junior Hunter title then…get stuck. I understand why they get stuck–the jump from Junior Hunter to Senior Hunter can be quite significant. “What’s next?“, they often ask. “What do I need to teach my dog to get her ready for Senior or Master?” Our response is usually about steadiness, a solid recall (a must in order to get that reliable, prompt retrieve), and a polished retrieve. Let’s start with understanding the importance of steadiness or “whoa” training. Holding point (through flush and shot), backing a pointing dog, stopping to a wild flush, not bumping birds, are all about steadiness. 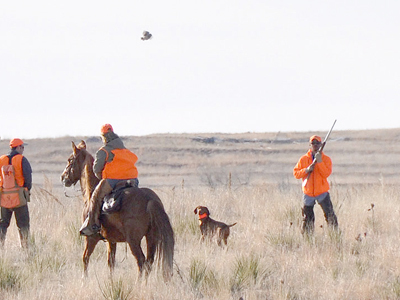 These are examples of situations your pointing dog will need to handle correctly in the advanced Senior and Master level hunting tests as well as in Gun Dog stakes (field trials). Some people prefer to verbally command their dogs to “whoa” in such situations–and, this can work–some of the time–at least until you get to the Master level. But, telling your dog when to “whoa” is a whole lot more work than just teaching your dog to reliably “whoa” in specific situations without a command. Also, if you rely on the “telling your dog when to whoa” method, your pass rate will not be as good because your dog will often give into temptation (make the wrong choice because he doesn’t truly understand) without you there in his ear telling him when to “whoa”. If he’s hunting with independence (as he should be), he will often be out of voice range. It’s a whole lot easier to first, just put the time and energy into teaching “whoa” correctly. This is b-o-r-i-n-g-b-o-r-i-n-g yard work. But, once done correctly and the command/corrections have been consistently, repeatedly delivered, your bird dog will truly understand “whoa”. Never, ever try to teach “whoa” in the field on birds. Never. Ever. Once your dog understands “whoa” in a boring place like the backyard and inside the house, move to slightly more distracting environments. Read that again and this time focus on the word, slightly. Another common mistake we see in “whoa” training is people moving too quickly to the next step when their dog isn’t consistently responding to the command in a variety of less stimulating places/situations first. Then, we hear things like “he really does know what I’m asking, he’s just being stubborn (or willful).” Don’t get me started on these most ridiculous (and offensive) statements. BTW–my response to these statements are that no, the dog isn’t being “willful” or “stubborn” but rather, the dog doesn’t truly understand what you’re asking of him. Read that as: You’ve failed as his trainer. If you’ve taught your dog the “whoa” command correctly, transitioning the training to the bird field should go relatively quick. It won’t go smoothly, but it should go quickly. Remember, each time you change the environment on your bird dog, be ready to “start over” in your training–be ready to correct mistakes and help your dog learn to apply what he’s learned in these new conditions. BTW–the “fancy” term for this is “generalization”. Dogs don’t generalize. It’s up to you to help them understand how to apply their knowledge in a variety of situations and locations. It’s your job to teach them to generalize. The easiest way to teach “whoa” (along with many other valuable skills your pointing dog will need to know) is to get a copy of Jon and Cindy Hann’s “A Perfect Start” and “A Perfect Finish”, http://www.perfectionkennel.com or http://www.gundogsupply.com/pestpefisetd1.html. Watch these video repeatedly and practice, practice, practice in short intervals so as to not shut your dog down. Vizsla Amante in an AKC Senior Hunting level test. She demonstrates her steadiness as she stands through the flush and then multiple shots. The gunners had to wait until they could take a safe shot. It’s hard to tell from a picture but this bird flew up and over Amante–A VERY TOUGH SITUATION! She didn’t move her feet but only turned her head to mark the fall of the bird. Unfortunately, if your dog is already hard-mouthing birds or will not bring a bird back to you (even within a step), the fix usually requires help of a professional trainer. Teaching polished (or even acceptable) retrieves often involves a high level of knowledge and training. This training is generally referred to as “force breaking” or teaching a “trained retrieve”. The best thing you can do is to not ruin your pup’s retrieve in the first place (assuming your pup is a natural retriever). Don’t ever yell at your pup for carrying objects around–regardless of whether the object she’s carrying is appropriate or not. If the object isn’t safe or appropriate, ask your pup to trade, “drop” or “give”. There are many articles and books that teach this–trust me, this is training well worth investing your time and focus in. (Hint: If your dog isn’t hard-mouthing the bird but just won’t bring it all of the way into you try teaching your dog a reliable recall–and I mean reliable. But, do the recall work away from birds!) Also, think about the retrieving “games” you play with your dog and how you play them. Are you unintentionally “practicing” bad retrieving habits with your dog? We did–for years. Then, working with Jon and Cindy Hann helped us understand the root of the retrieving problems we were having. Once we started peeling back the layers we began to see–and understand–more clearly. Once we understood, we were better able to help teach our Vizslas the correct behaviors and eliminate the confusion we had created for them. If you want your grown-up bird dog to retrieve nicely, you should then approach your pup’s retrieving with much seriousness. Dedicate time to playing retrieve games but make sure you’re playing these games correctly. Read articles about how to foster your pup’s natural retrieving desire and appropriate body language (yours and learning how to read your pup’s). Here’s one by Scott Rall we really like,http://www.northlandoutdoors.com/event/article/id/32708/publisher_ID/24/. Yes, you can hope your dog has beautiful retrieves throughout his entire life but, this often isn’t the case. A good or even just an acceptable retrieve often spirals once more pressure is put on a dog in as he is being “steadied” or “broke”. Getting a pointing dog ready to run in advanced tests and trials isn’t as simple as steadiness and a finished retrieve though. There can be so many more issues you and your dog need to address before you’ll consistently succeed. Such is the fun of training! Always a new discovery around the corner. :-) So, get out to as many hunting tests and field trials as you can. Walk/ride as many braces as possible and find people who will take the time to talk with you. Watch the “broke” dogs and their handlers. You’ll learn so much by watching the performances of a the different teams out there. 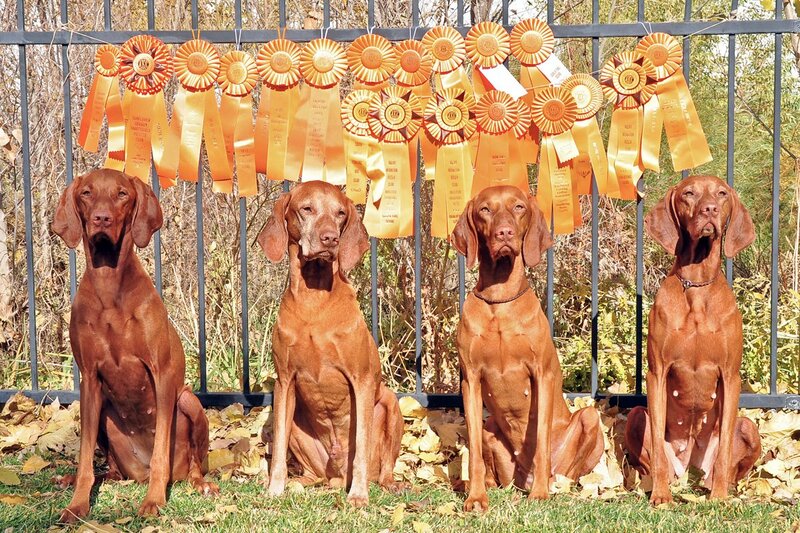 YOu can check out the field calendar for Colorado and surrounding states at, www.fieldtrialnews.com and the AKC’s website (browse to the “Events and Awards Search“). Getting ready for AKC Master level hunting tests. 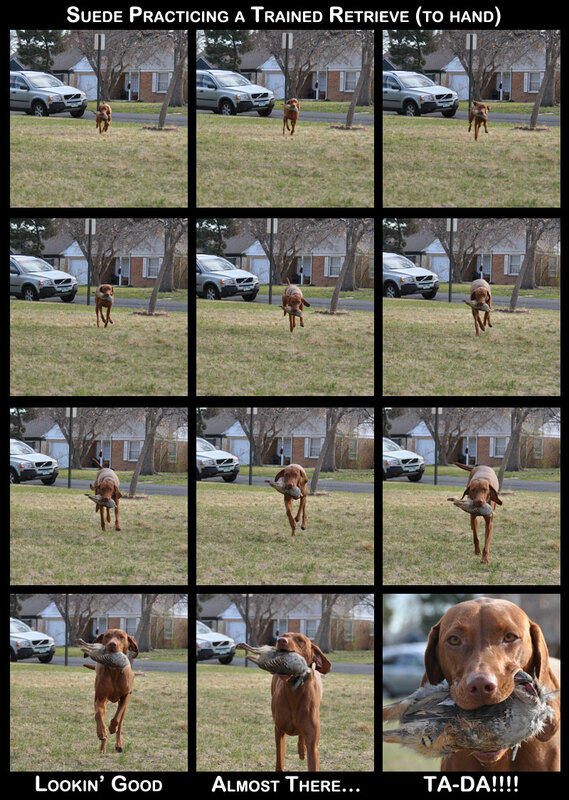 Vizsla Suede practicing her trained retrieve. She doesn’t mouth her birds, but holds them with a “soft mouth” and will not drop the bird until given the command to do so.